Director Ron Howard’s (The Dilemma) biography movie Rush scored plenty of acclaim but not as big a box-office take as it deserved. 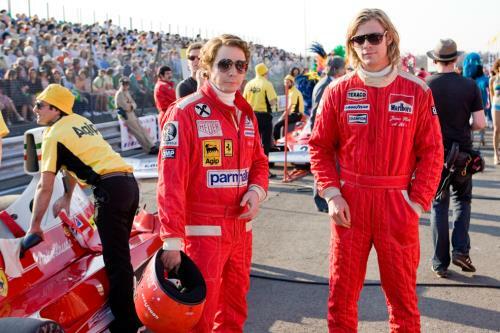 The film stars Chris Hemsworth (Snow White and the Huntsman) and Daniel Bruhl (The Fifth Estate) as rivaling Formula One racers James Hunt and Niki Lauda, respectively. Rush follows the two drivers in their 1970s atttempts to be number one. Olivia Wilde (The Words) and Alexandra Maria Lara (The Reader) also star in the movie, as the women behind the racers. Rush was nominated for two Golden Globe awards: Best Supporting Actor for Daniel Bruhl and Best Motion Picture – Drama. It scored highly with critics and moviegoers, earning 89% and 92% approval, respectively, according to Rotten Tomatoes. Despite the praise, however, the film grossed only $27 million in wide release in U.S. theaters, but brought in a whopping $63 million overseas, where Formula One is more popular. Even if you don’t know much about this type of racing, we recommend Rush as a fascinating look at two men whose ambitions drove them to push forward no matter what the danger. featurette “Ron Howard: A Director’s Approach,” about Ron Howard’s passion for filmmaking. “Around the World in One Location,” with Ron Howard and the other filmmakers explaining how they created the illusion of shooting all over the world despite not leaving the U.K.
“The Rock and Roll Circus” about the glamorous F1 circuit of the 1970s.